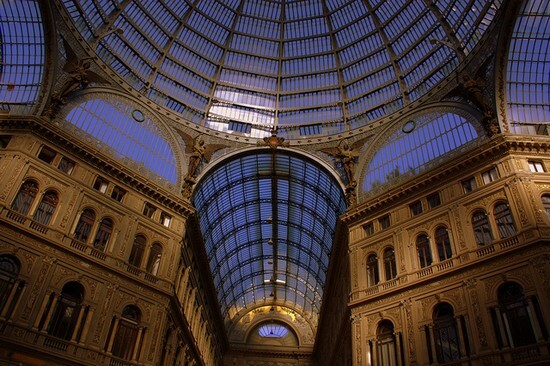 Experience the grandeur and elegance of 19th-century Naples while shopping at the Galleria Umberto I in the city’s historic center. Rising above the busy Piazza Trieste and Trento, the Galleria Umberto I in Naples is one of the finest examples of 19th-century architecture in Italy. This grand shopping center was constructed from 1887 to 1890, and was patterned in many ways after Milan’s famous Galleria Vittorio Emanuele II, which had opened with great success in 1875. Named after the King of Italy, the Galleria Umberto I was one of the many important architectural works constructed during the period of urban renewal in Naples that took place in the late 19th century. The Galleria Umberto I sits grandly at the intersection of the royal and cultural heart of Naples. 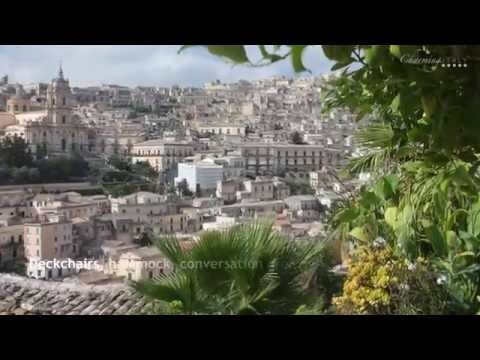 The Palazzo Reale, or Royal Palace and the famous Teatro San Carlo are just across the piazza from the Galleria, as well as the grand Piazza del Plebiscito. 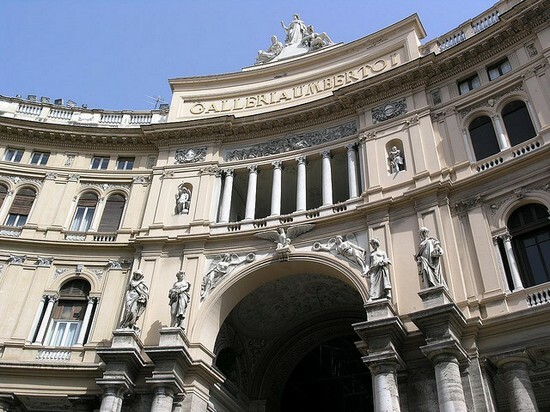 The Galleria connects these important buildings with the Via Toledo and Via Chiaia, two of the most popular shopping streets in Naples today. More refined and innovative in design than the Galleria in Milan, the Galleria Umberto I was the work of Emanuele Rocco, Antonio Curri and Eernesto Di Mauro. The grand entrance across from the Teatro San Carlo is decorated with statues, columns, angels and an eagle with outstretched wings above the entrance arch. Once you step inside, your eyes are immediately drawn up to the impressive glass dome that soars 56 meters (184 feet) above. 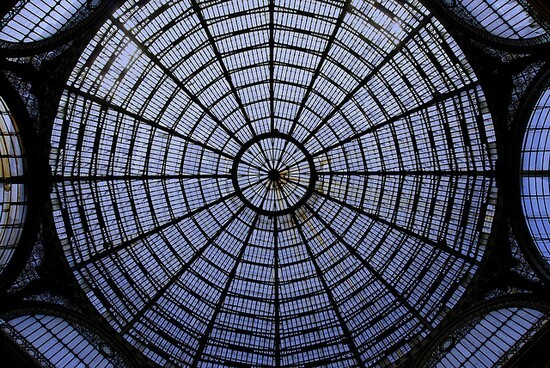 The iron and glass dome was the masterwork of Paolo Boubée, and its design was influenced by the Galleria in Milan and the covered passages in Paris. 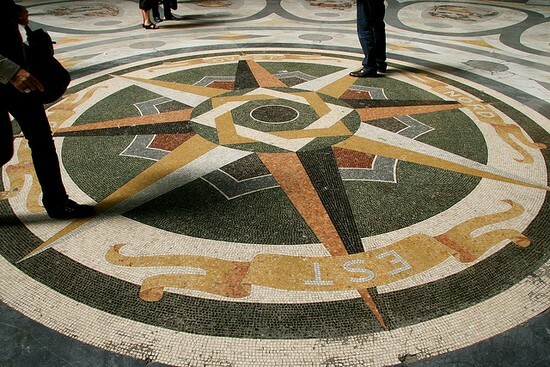 While the view up is spectacular, don’t miss the marble floors, especially at the center of the Galleria where you’ll find a compass with the cardinal directions surrounded by depictions of the zodiac signs. 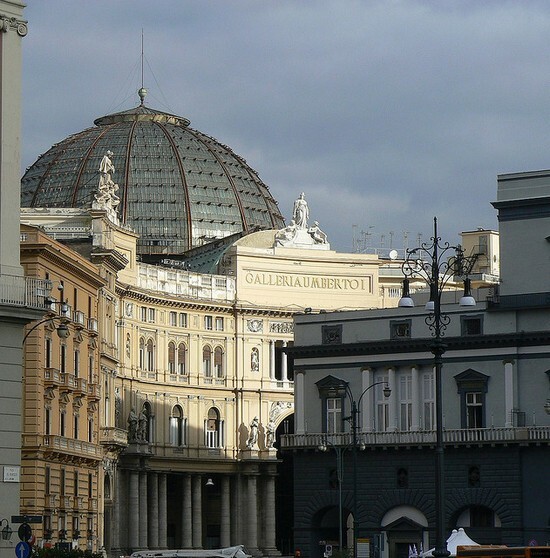 Today the Galleria Umberto I is still at the center of one of the most popular shopping areas in Naples. Inside you’ll find elegant shops as well as cafés where you can stop and enjoy the beautiful architecture. People pass through the Galleria to reach the excellent shopping street Via Toledo just outside one of the entrances, which is the location for many brand name shops as well as specialty boutiques. From there you can cross over to Via Chiaia, where you’ll find the most exclusive boutiques along with antique shops and art galleries. 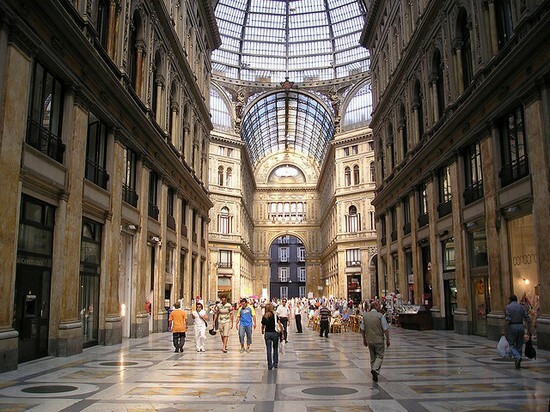 Start your day of shopping in Naples is in the stunning Galleria Umberto I before exploring the fine shopping streets nearby! 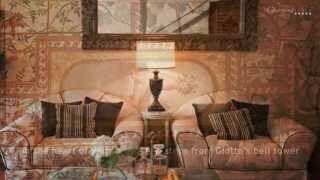 Have you ever been at the Galleria Umberto I?